By Friday we should know the result of the UK General Election. Polls have shown very little movement for the two main parties, but they have not been the main story this time. In what must be a first, Scotland has figured as the main talking point, causing cognitive dissonance so extreme that the main political parties (Labour, Tory, Lib Dem) are sending out a series of confused and confusing messages (Vote SNP Get Labour, Vote SNP Get Tory, Vote Labour Get SNP etc etc). Politics since the rise of neoliberalism has seen a steady rise in meaningless messages. Vote for the person you want to drink a beer with, vote for stability, “hard working families“, “change“. Back in the 70s when financier David Rockefeller was freaking out with the rest of the elites over what had happened in the 60s, he set up the Trilateral Commission to study what had went wrong and how to fix it. He got academics from the USA, Europe and Japan to have a think and they produced the Crisis of Democracy. One of the academics involved, Samuel Huntington declared the problem was an “excess of democracy” and the solution was a return to public apathy. While elites have not been as successful as they might have hoped in eliminating the public from politics, they have created a crisis of democracy in the sense that few people have any faith in the system, whether in the UK or other “Western” governments. And so neither the Tories nor Labour, if the polls are correct, will win an outright majority (326 seats out of 650). And the neoliberal party par excellence, the Liberal Democrats look like they will pay for having gone into coalition with the Tories, few buying their line that they made the last five years more human. While the UK media, particularly the BBC, spent the past few years talking up the popularity of the far right, anti-immigrant UKIP party, they look like they may not win as big as predicted, their leader Nigel Farage in danger of not gaining his seat. But – again if polls are correct – the real beneficiaries of the election will be the Scottish National Party who look to go from 6 MPs to anywhere from 20 to 50+. Scotland sends 59 MPs to Westminster, and the majority have always been Labour, which has dominated Scottish politics for almost a century. But since the Blair years, the party has been seen as less and less progressive and the Iraq War was the last straw for many. The Scottish Parliament has meant that the SNP has had the opportunity to govern, and have largely been judged competent, which compared to the machine politics of Scottish Labour is high praise indeed. And the SNP have now positioned themselves as part of a progressive, anti-austerity alliance with Plaid Cymru and the Greens. The assorted media and political elites have been unable to comprehend what is happening, and have trotted out many of the same scare stories from the Independence Referendum, but have been unable to make much traction with them. While they were pulling in the same direction during the referendum, they’re now attacking each other as well as the threat of the SNP, so their messages have been less consistent. They have wheeled out Gordon Brown, however, who gave a “thunderous”, “barn-storming” speech. What difference it will make to anyone remains to be seen, but journalists liked it. 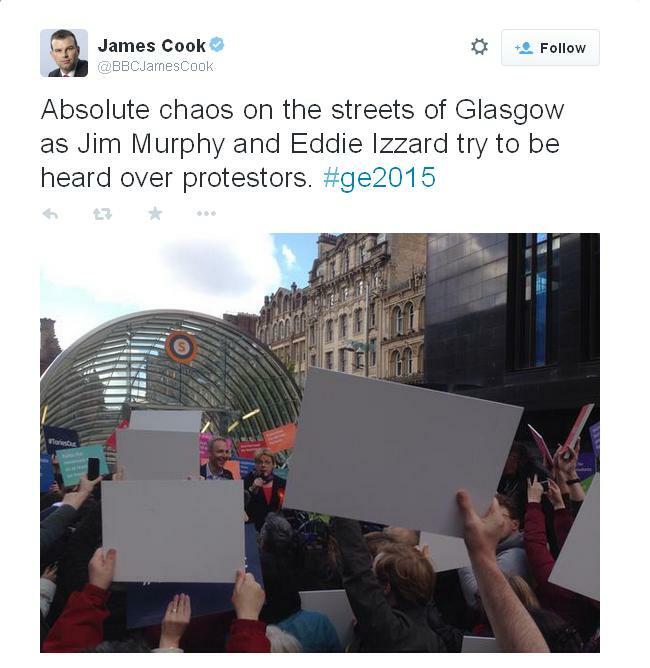 And of course, embattled Scottish Labour leader Jim Murphy was able to get news because he was hectored by some noisy protesters. This was reported by one journalist as “absolute chaos on the streets of Glasgow”; anyone aware of what’s going on in Baltimore might assume this journo has led a rather sheltered existence. It all seems like deja vu. During the referendum, the fear factor was ratcheted up, and as polling day approached warnings of apocalypse became ever more hysterical. And as we near polling day, dire warnings continue that if we don’t stick with the status quo – either the Con/Dem coalition or Labour in Scotland – everything will fall apart. 1 million people reportedly use foodbanks in the UK, a 19% year upon year increase. The Tories say that they need another five years to finish the job, presumably getting millions more to use foodbanks. The Labour Party’s response is to carve their “pledges” into a tablet of stone. But as Labour’s candidate Lucy Powell points out “I don’t think anyone’s suggesting that the fact he’s carved them into stone means he’s absolutely, you know, not going to break them or anything like that.” One thing is for certain, all the mainstream parties believe “passionately” about something or other. UK General Election. The Empire strikes back – again! The UK General Election continues to go from bizarre to dysfunctional and it’s all the fault of Scotland! Having assured themselves that they had killed off the independence threat back in September 2014, the Unionist parties (Conservative, Labour and LibDem) turned their attention to the upcoming election in May, assuming it would be business as usual. And yet, as with the Independence referendum, they have been caught off guard, and are scrambling around trying to look like they have some relevance to the real world. The Tories are split between those who seem to be talking up the SNP, which polls suggest may wipe out the Scottish Labour vote, and those who warn about the long term consequences of this strategy. The Labour Party south of the border has made it clear that they won’t go into coalition with the SNP – which is fine, as the SNP have already said they wouldn’t join them in one – and appear to have written off the party north of the border. The LibDems object to all of it, but then they are facing electoral oblivion as no one who voted LibDem in 2010 can forgive them for going into coalition with the Tories. They are left making obtuse pronouncements, such as Scottish LibDem leader Willie Rennie’s statement: “Vote for everything, vote LibDem“. After a UK leader’s debate in which SNP leader Nicola Sturgeon was seen as the clear winner, there were Scottish leader’s debates, which basically came down to the Unionist parties shouting at Nicola Sturgeon. (One Scottish debate included Green Party co-covenor Patrick Harvie, but he was kept out of the other ones for some reason). Then there was another UK leader’s debate, but this time the Prime Minister didn’t show up, and his deputy wasn’t invited (here he is freaking out after being asked difficult questions). So this debate had Labour challenger Ed Miliband, far right UKIP leader Nigel Farage, and Nicola Sturgeon, Leanne Wood of Plaid Cymru (Welsh nationalists) and Natalie Bennett of the Greens. The three women articulated progressive politics (ending austerity, not renewing Trident nuclear weapons), Ed tried to sound relevant and Nigel Farage attacked the audience for being too left wing. Sturgeon was seen as the clear winner from the debate, Milliband did better than most people expected and Farage appealed to his base. There’s still over two weeks to go, but so far the SNP continues to outpoll Labour. Sturgeon has become one of the most popular politicians in the entire UK, and journalists in England are beginning to discover that there’s more to Scotland than alcoholism and deep-fried Mars bars. No doubt the Westminster machine is planning some new surprise to try and halt the advance, but their last attempt at a smear backfired badly, and they lack the sort of consistent strategy they had during the referendum. Perhaps they can just send a bunch of politicians up north to try and reason with us like last time. Back in September 2014, Scotland narrowly rejected voting for independence (45% Yes/55% No). In the last minutes of a two year campaign, the leading lights of the Westminster elite suddenly noticed that polls showed the possibility of a Yes vote, so they hopped on planes and trains and traveled north to express their love for their neighbours and warned of impending doom if we chose to leave the umbrella of the British State. Â Whether it was the “Vow” promising extra powers for the Scottish Parliament or fear of change, in the end the vote for the state quo won out. It has become a tradition in politics to say what you really mean after you have received the result you were after. And so, true to form, David Cameron appeared at 10 Downing St on the day after the vote to announce that the the Vow’s promises of more powers for Scotland would happen “in tandem with, and at the same pace as” “English Votes for English Laws” (weirdly acronymed as “EVEL”). Â As the process of devolution in Scotland has taken decades and devolution for England’s regions has yet to occur, it would appear that any new powers for Scotland will be some time in coming. Â It’s important to remember that England has 84% of population of the UK, Scotland 8%, Wales 5% and Northern Ireland 3%. Â The reasons for devolution in Scotland, Wales and Northern Ireland have a great deal to do with those statistics, especially as the “unwritten” British Constitution has never made any attempt to balance out the differences in population in terms of political representation. Â (Attempts at some sort of federal structure were proposed by the Liberal Governments of the late 1800s/early 1900s, but were rejected by the unelected House of Lords). Immediately after the vote, Scottish National Party leader Alex Salmond broke with standard political tradition and made a surprise announcement that he was standing down as party leader, stunning the assembled media. Â The leadership passed on to his deputy, Nicola Sturgeon, who has become one of the most popular politicians in the entire UK (Salmond, in contrast, rubbed some people the wrong way). More worryingly for the Westminster elite, the Scottish National Party has, like the rest of the Yes supporting parties (Greens, Scottish Socialist party) seen a rise in membership. Â The SNP’s rise is the most spectacular of the Yes parties, standing at over 105,000, making it the third largest party by membership in the entire UK. The Scottish Labour Party, on the other hand, has seen it’s support disappearing. After the referendum vote, the Leader of Scottish Labour, Johann Lamont resigned, saying that London Labour treated Scotland like a “branch office“. Â (“Scottish Labour” is not an officially recognised party in Scotland, unlike every other party in the Scottish Parliament). Â The less than popular (in Scotland) Blairite Jim Murphy became the new Leader and the punditry assumed that everything would fall back into place. But that didn’t happen and polls have been suggesting that Labour may lose anywhere from 20 to 40 seats in ScotlandÂ to the SNP, meaning that if Ed Miliband were to have a chance of forming a government he would need to get support from SNP MPs. All of this has caused consternation to supporters of the status quo, and as during the referendum campaign, some peculiar views have made themselves shown, from weirdly unfunny cartoons to downright bizarre opinion pieces about “mad“, “deluded” Scots. And we’ll have more of this until the election for the UK Parliament on May 7, especially as Nicola Sturgeon was considered the winner in a novel tv debate which pitted 7 party leaders against one another – Tory David Cameron, his Deputy in the Coalition, LibDem Nick Clegg, Labour’s Ed Miliband, Far right UKIP leader Nigel Farage, Green Party leader Natalie Bennet, Plaid Cymru (Welsh Nationalist party) Leader Leanne Woods and Sturgeon. The debate was remarkable, not just because progressive positions were actually heard on a UK political program (something the Blairites in particular must have thought they had finally killed off), but because of the contrast between fourÂ men offering neoliberal platitudes and three women offering progressive alternatives. Farage, attempted to blame all the UK’s problems – including HIV – on foreigners, thus representing the right wing of mainstream UK politics. His views on HIV lead to the first round of applause of the night, for Plaid Cymru’s Leanne Wood, who stated he “should be ashamed of himself”. Sturgeon followed this by saying “When someone is diagnosed with a dreadful illness, my instinct is to view them as a human being, not considerÂ what country they come from.” All of the women rejected his anti-immigrant stance. And following on from her success at the debates, with voters in England asking how they could vote SNP, the Tory supporting Daily Telegraph had the inevitable bombshell: despite saying that the SNP would never work with the Tories, Sturgeon secretly wanted Cameron to win. Â The story was that she had told this to the French Ambassador at a meeting in February. Only problem with the story was that she denied it, as did the French Ambassador, the French Consul General and everyone else who was actually at the meeting. The story came from a memo by a civil servant who wasn’t at the meeting, but had heard about it from the French Consul General. As the BBC’s James Cook explained, it was a “third hand account”. Â And most oddly, the journalists who wrote the story never asked Sturgeon or the French Ambassador for a statement. The story now seems to have died the death, with Labour MPs deleting their tweets about it, and the LibDem in charge of the Scottish Office, where the leak emerged from now dismissing it as “these things happen“. Â In any case, there is to be an inquiry about the leak by the Civil Service. But it’s unlucky that this smear will be the last. After all, it’s tradition. Scotland makes BBC minds meltdown! The aftermath of the Scottish Independence referendum rumbles on: despite winning, the pro Union side seem to be snatching defeat from the jaws of victory. While the once dominant Labour Party looks set to lose seats to the SNP in the coming UK elections, the Yes supporting parties (SNP, Greens, Scottish Socialist Party) are all seeing rising member numbers. The SNP is now the third largest party in the whole of the UK. Apparently Salmond is “hateful”, and is waging a “vendetta” against the UK. He should “shrink away” because “he lost”. These are not views you’ll hear about Nigel Farage and his right wing United Kingdom Independence Party on the Beeb, but perhaps the fact the a prominent BBC producer has become director of communications for UKIP explains why.